We did it! What a fantastic day out that was. Brilliant turn-out by the Irons fans. Met up with some mates around Baker Street before the game for a couple of pre-match beers. 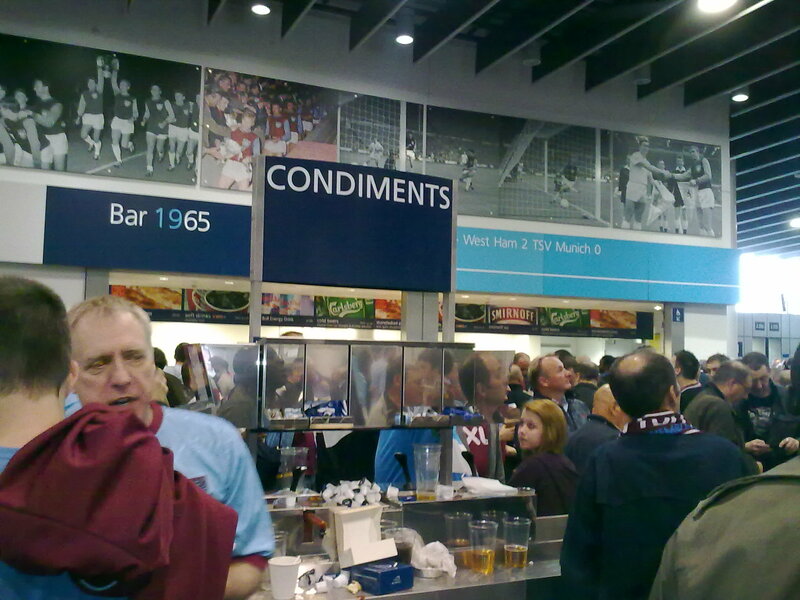 All the bars around the area were full with West Ham. Finished up at a place called the Temperance (strange name for a pub!). Good laugh there, especially when the owner of a fishing tackle shop across the road decided to close up and come and join us. 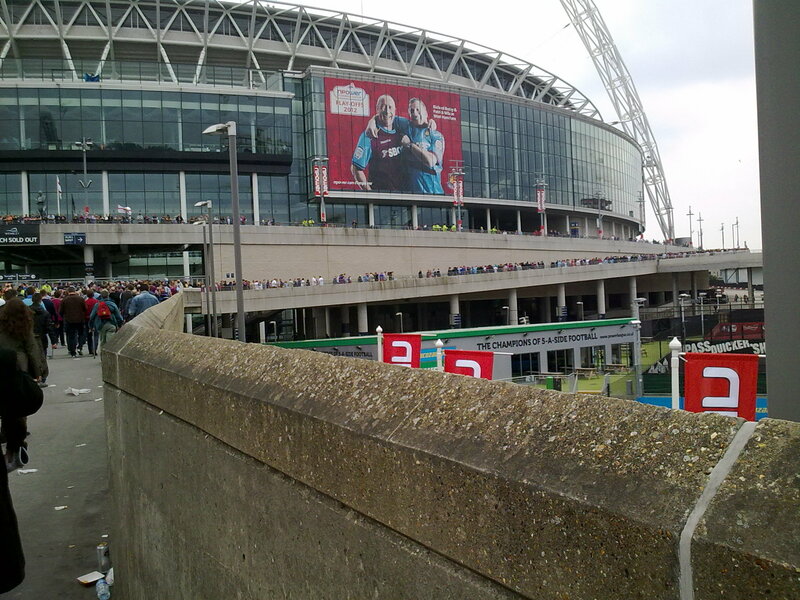 Left for the stadium around 2.00, arriving at Wembley Park about 2.30, to be greeted with a sea of claret & blue, with just a little tangerine mixed in. Decent seat (not that I actually sat in it) just to the right of the goal. Was this an omen? This was the anniversary of the day West Ham won the European Cup Winners Cup at the old Wembley in 1965. 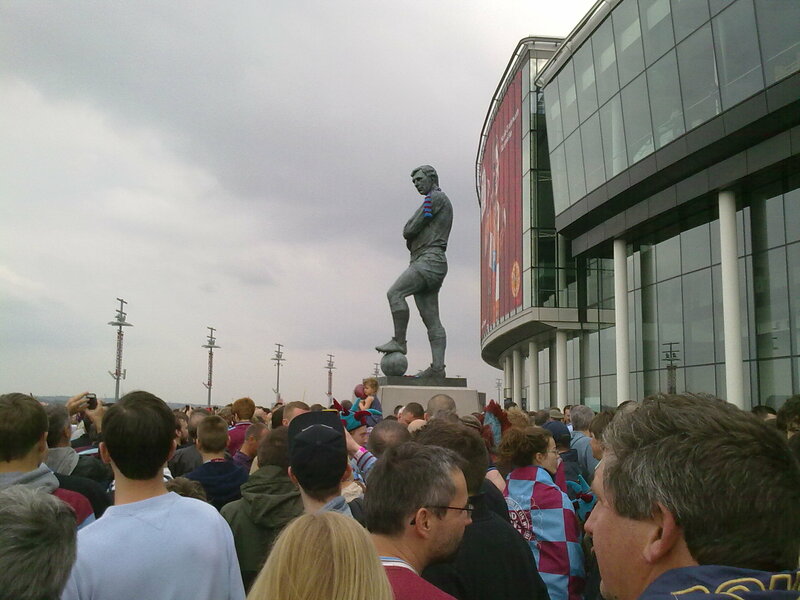 Bobby Moore, proudly wearing his claret and blue scarf. Could we repeat history and record another Wembley win? It didn’t seem like it for the first 15 minutes of the match, when Blackpool had three good chances to score, but a good save by Green, and two poor finishes kept us in the game. Ince was giving us a few problems down the left. Having survived these scares, we gradually started to impose ourselves on the match and started to make a few half-chances of our own. Then Matt Taylor broke down the left, got a bit of luck, and sent a long angled ball towards Cole, who’d peeled off his marker, brought the ball down and fired into the net to send the West Ham throngs mad with delight. Vaz Te had a decent chance to add to the lead shortly after, but pulled it wide. Second half saw Blackpool come at us all guns blazing, and were soon rewarded with an equalizer from Ince, which was almost a carbon copy of Cole’s goal. They were well on top at that stage and had more excellent opportunities to score again. We survived due to a couple of goal line clearances and some crap finishing. Big Fat Sam had to change things, and brought on McCartney for O’Neil, to shore up the left side and reduce the threat from Ince. As in the first half, we got back into it a bit, and had opportunities of our own, notably a Nolan effort that crashed against the bar. Just as it was looking like going to extra time, Nolan got free down the left, played the ball into the box, where Cole showed excellent control to slip the defender in a tight area, and then excellent desire to nick the ball way from the keeper, where it fell to Vaz Te, who smashed it into the roof of the net. Cue utter pandemonium in the 40,000 strong Hammers support. Could we hold on for the last few minutes? I had a horrible flashback to Cardiff 2006 when the board went up showing 4 minutes of added time. Surely fate couldn’t conspire against us again? This time however, we played out the added time with little scare, managing to keep good possession up their end of the field for much of it. Then the final whistle, and delirious celebrations, both on and off the field.